Strange things are happening in Tel Ilan, a century-old pioneer village. A disgruntled retired politician complains to his daughter that he hears the sound of digging at night. Could it be their tenant, that young Arab? But then the young Arab hears the digging sounds too. Where has the mayor's wife gone, vanished without a trace, her note saying "Don't worry about me"? Around the village, the veneer of new wealth—gourmet restaurants, art galleries, a winery—barely conceals the scars of war and of past generations: disused air raid shelters, rusting farm tools, and trucks left wherever they stopped. 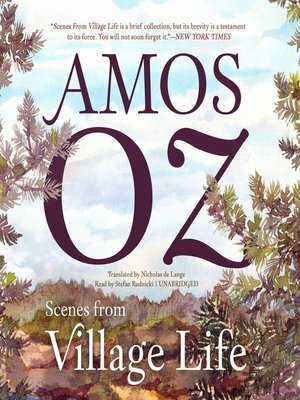 Scenes from Village Life is a memorable novel-in-stories by the inimitable Amos Oz: a brilliant, unsettling glimpse of what goes on beneath the surface of everyday life.